Lamb Kebabs with Summer Couscous, easy gourmet dinner recipes. Another summer barbecue classic: Kebabs (or Kebobs). They can be made with chicken, beef, pork or seafood but the true classic is Lamb. 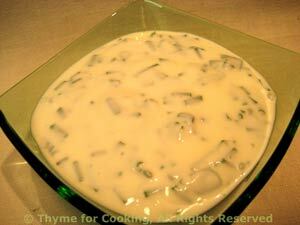 I broke with tradition by making a simple, minted yogurt sauce rather than the traditional Tzatziki with cucumbers. Serve the kebabs on couscous for an easy summer dinner. The kebabs can be assembled first, then marinated, getting all the prep for the dinner out of the way early. Reserve a bit of each pepper half for the couscous. It does look nice to have the meat and vegetable on the same skewers - and you can do that if you partially pre-cook the vegetables. I prefer to do it all on the grill, and, as the different foods have different cooking times, arranging them on the skewers accordingly. 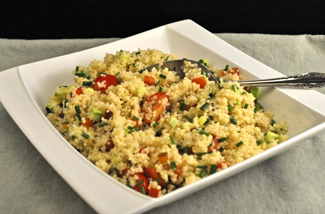 Serve on a bed of Summer Couscous, Minted Sauce on the side. In large, deep bowl whisk together all ingredients for marinade. Cut meat and add to the marinade; let marinate for 20 - 30 minutes or up to 4 hours. Clean peppers and cut into 1 1/2 " (3.75cm) squares, refrigerate unused halves. Peel and cut onion into 8 wedges. Cut zucchini into thick slices, about an 3/4 inch (2cm). Add all vegetables to bowl with meat/marinade and stir to coat. Thread meat, mushrooms and tomatoes on 2 - 3 skewers, alternating. Thread peppers, onions and zucchini on 2 - 3 skewers, alternating. Cook vegetable skewers on barbecue grill over direct heat for 10 - 15 minutes, turning once. When vegetables start to brown move to indirect heat and cook for another 5 - 10 minutes. 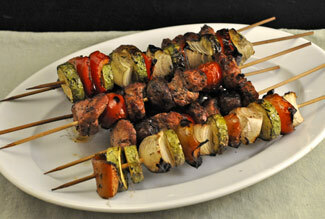 When you move the vegetable skewers, start to cook meat skewers over direct heat. Cook until meat is done to your liking. We cooked ours for about 8 minutes, turning once. Remove and serve on a bed of Summer Couscous. Combine all ingredients in a small bowl. Mix well and refrigerate until ready to use. Serve with kebabs.